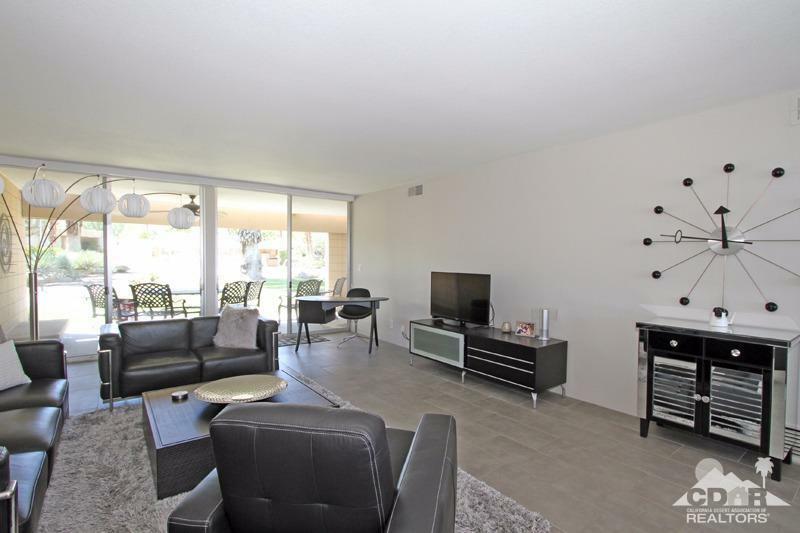 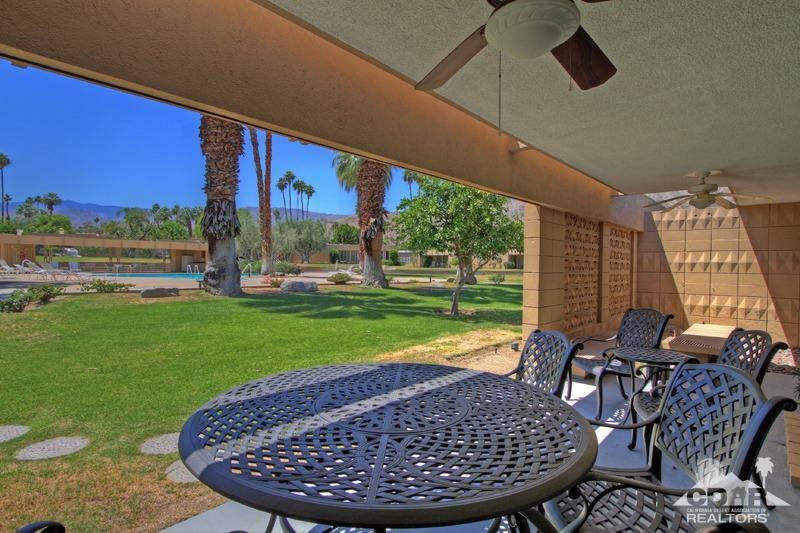 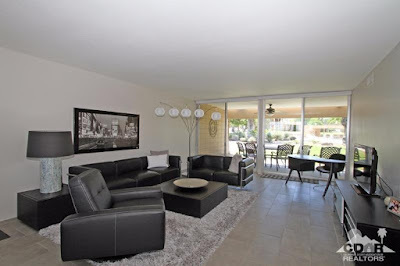 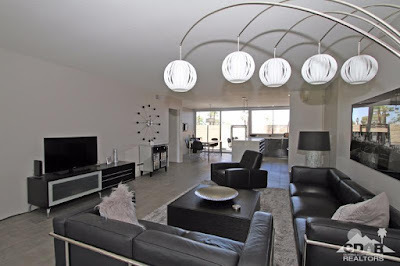 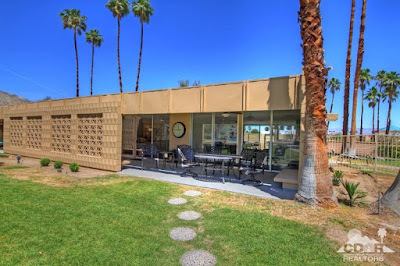 On the market now for a few weeks is this 1962 Palmer & Krisel-designed Sandpiper condominium for sale in Palm Desert, CA. With two bedrooms and two bathrooms, the asking price on this 1,351 square-foot condominium is $369,900 with monthly HOA dues of $495. Being sold fully-furnished, the home features a floor-to-ceiling renovation. 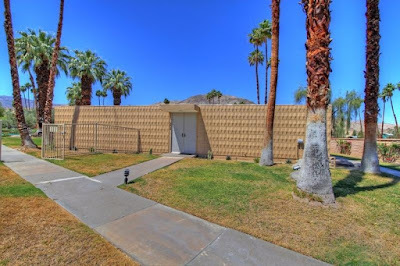 The front of the home features a hypnotizing pattern of diamond relief shadow block, with only a unassuming pair of white double doors breaking the pattern. 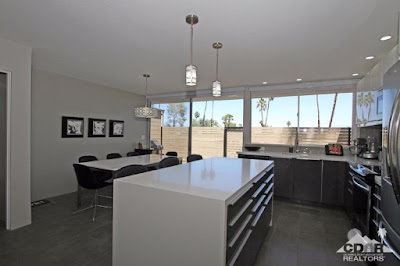 Inside, the home has seen the open-living concept applied to it, with the living, kitchen and dining combined into one large open rectangular space. The living room area overlooks the Sandpiper common area through a pair of floor-to-ceiling sliding glass doors. 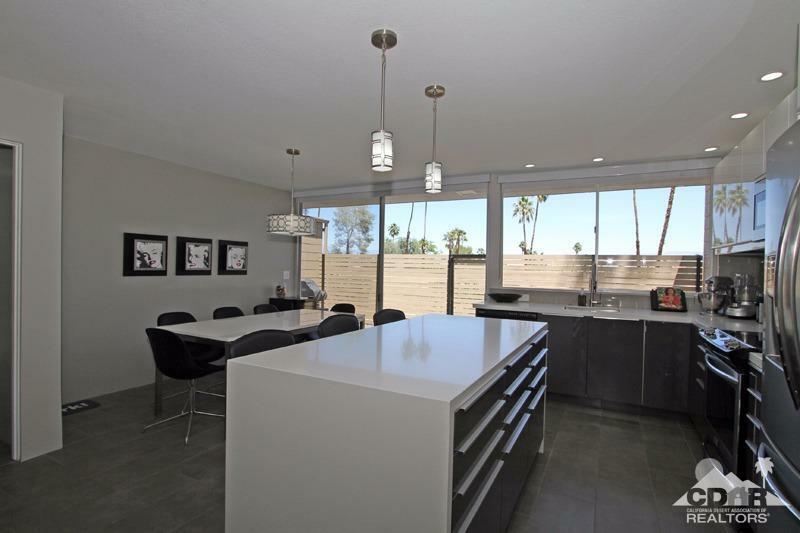 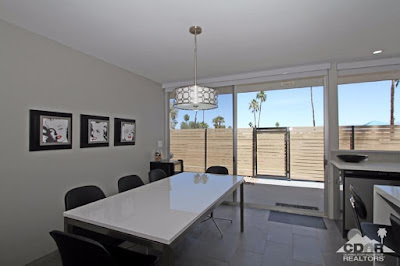 The dining area sits across and visible from the entry, and is open to the adjacent kitchen. 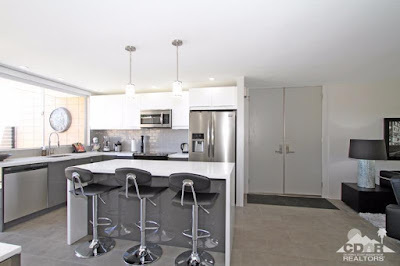 As the demising wall between the kitchen and living room has been removed, the front doors now open into the kitchen, which has seen a modern, clean-lined update. 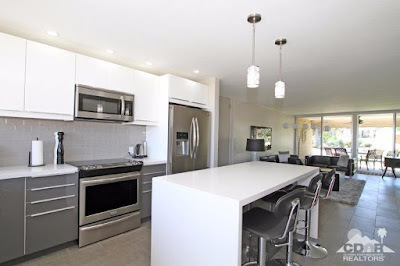 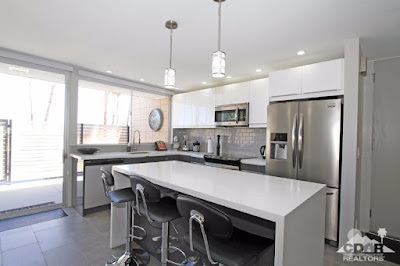 A fun combination of sleek grey lower cabinets mixed with glossy white upper cabinets line the room, along with well-thought out finishes like white quartz counters and grey tile backsplashes. Both the kitchen and dining overlook an adjacent private patio space. 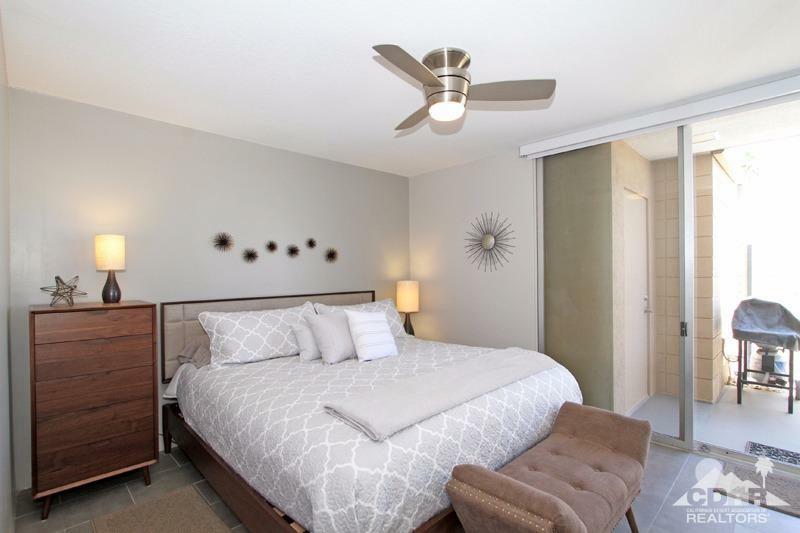 Both bedrooms sit adjacent to one another, with the secondary bedroom overlooking the rear private patio area while the master bedroom overlooks the Sandpiper common area. 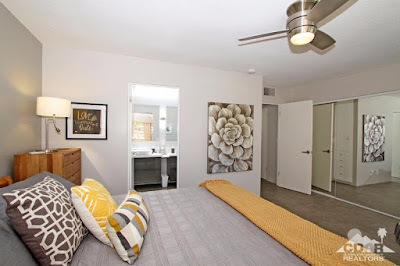 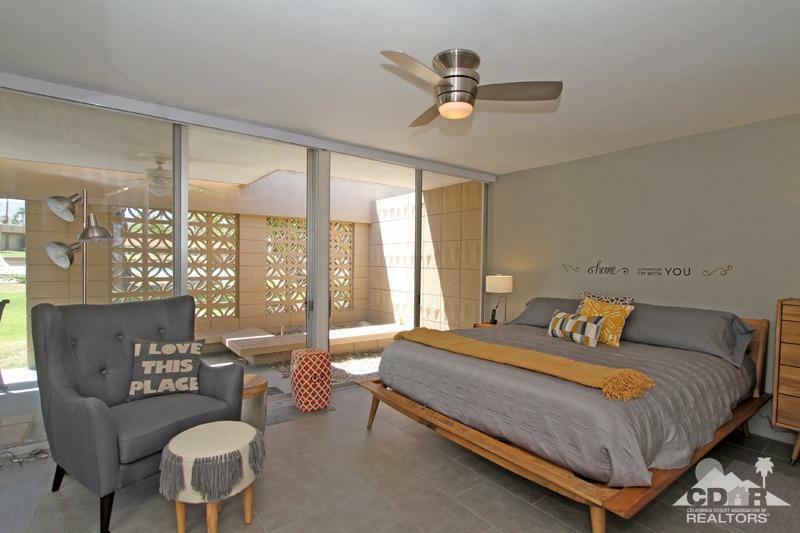 Both bedrooms feature floor-to-ceiling sliding glass doors and windows, tiled floors and mirrored closets. 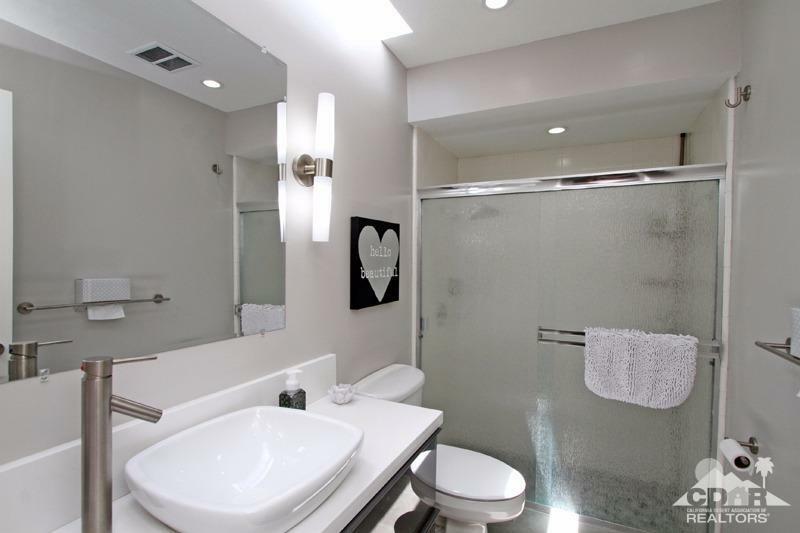 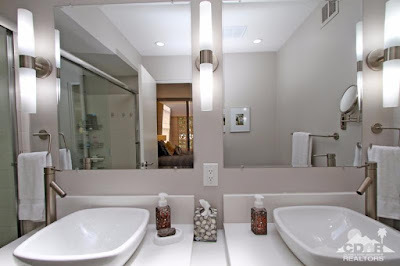 Both bathrooms have been updated in a similar fashion as the kitchen, with high-gloss grey floating vanities, low-profile sinks, and tasteful white and grey tile surrounds. 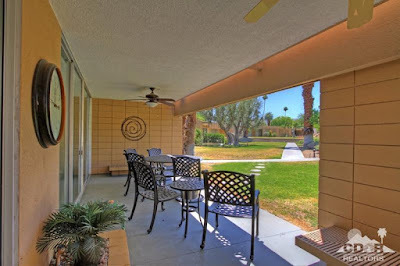 Like most Sandpiper homes, this residence contains two distinct patio areas, a public porch overlooking the Sandpiper common area and a private patio at the rear of the unit. 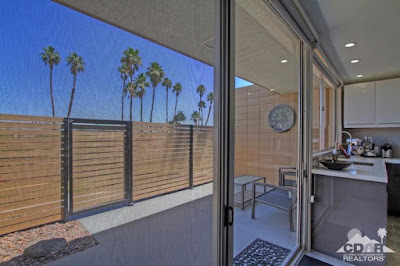 The patio off the living room features more great Sandpiper shadow and breezeblock, along with a signature Krisel sunflap overhanging the roofline. 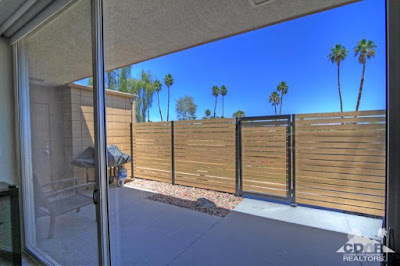 The private patio space features an updated wood-slat fence and ample paved patio area. 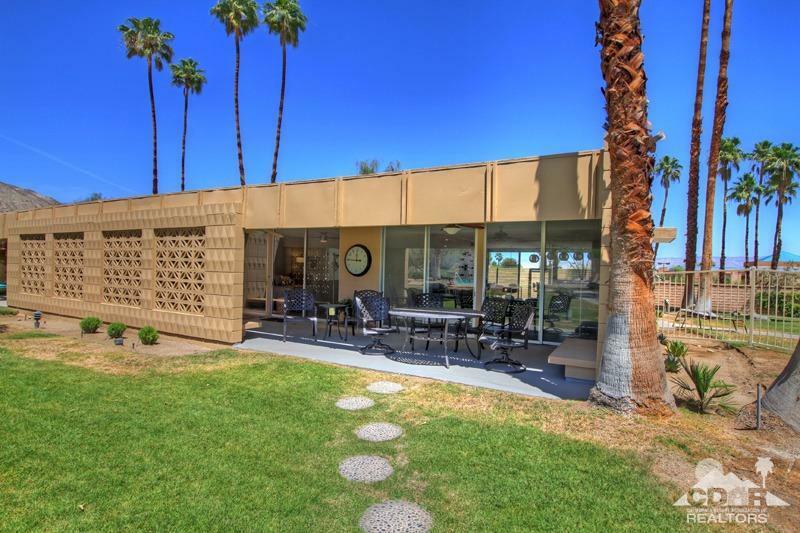 This is great opportunity to acquire a turnkey second home, that features a clean-lined modern take on classic midcentury architecture.